Radishes are not a vegetable that most people buy very often, but perhaps you should consider using it to make an easy healthy recipe! They have incredible health benefits and have a high nutritional value. These little red veggies can help prevent cancer, according to research studies. One interesting research study indicates that radishes have compounds known as isothiocyanates. These compounds affect the genetic pathways in cancerous cells, including cancer cell death. Talk about a superfood! These vegetables also reduce cholesterol levels, which lessens the risk of having a heart attack and getting heart disease. They also stimulate the production of bile, which is necessary for a healthy liver, gallbladder and digestive system. If you have high blood pressure or need to control your blood sugar, then radishes should be part of your diet. Also, this veggie is believed to be an effective treatment for jaundice and can help you lose weight. While they are not the most common ingredient, there are actually plenty of ways to enjoy radishes, whether they are cooked or eaten raw. Gardening for Geeks has a great easy healthy recipe for this nutritious food that tastes simply delish! Place the radishes in a casserole or other baking dish and mix in walnut or peanut oil. Roast in the oven until they are tender and just starting to brown, approximately 25 minutes. Since ovens vary, keep checking them the first time you make this dish. Remove from the oven, then add the soy sauce and green onions. Stir well, then roast for another 5 minutes. To see if they are ready, see if a fork can easily pierce a radish. Before serving, add just a bit of toasted sesame oil and sprinkle some Eden Shake on the top. This is such a tasty, easy healthy recipe that you really should try it. Radishes are an excellent veggie to use year-round. 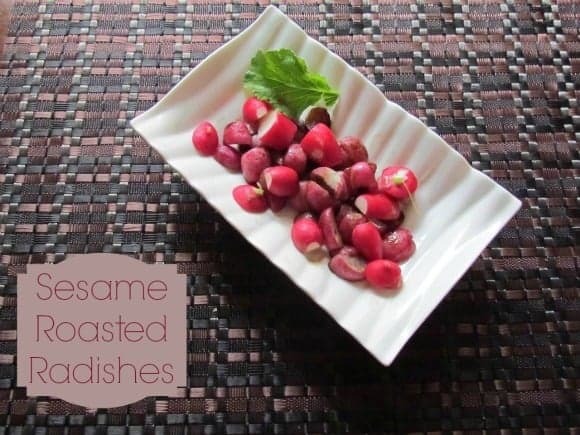 Sesame Roasted Radishes would go lovely with a turkey dinner or they can be eaten as a snack. If you have young children, this would be a great way to introduce radishes since they are not a commonly bought vegetable. This recipe sounds interesting. I really want to try these radishes. Thanks Shauna! Let me know how you like them! Hi Taylor! I tried to reply to your comment on Our 7 Day Real Food Challenge but I was unable to. and I’ll send you a bit more info about the challenge. Looking forward to the challenge!!! Hi Mary! It sounds great, sent you an email for more information and thanks for finding me! I like the odd radish in a salad, but I have never thought of roasting them! I’ll have to try that this summer. Thanks for sharing! Thanks Dani! Growing up, the only time I had radishes was in salads once in a while – this was something new to try and I enjoyed them! Are Bullying Victims More Likely To Drop Out Of School?